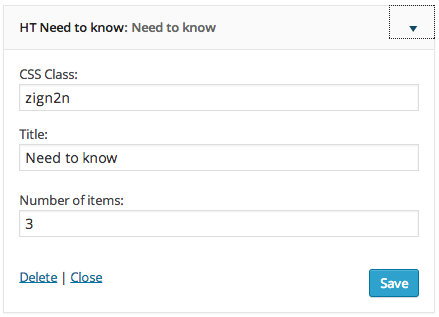 By default, the “Need to know” widget will appear like the rest of the widgets, with a coloured bar at the top, black text and standard links. To make the area stand out more, you can add some custom CSS to the widget. To enable CSS for a widget area, we use the Zig Widget Class plugin which adds an extra field to widgets for a CSS class. You’ll need to install and activate this plugin before adding your custom CSS. Read the task on how to customise css styles and paste something like the following into the custom css field. This example uses zign2n as the class name that we’ll use in the widget.